For my 57th birthday (January 8, 2008) I wanted to share an aircheck of a jock who worked with me at WFEC in Harrisburg, Pennsylvania, and at KAFY in Bakersfield California. 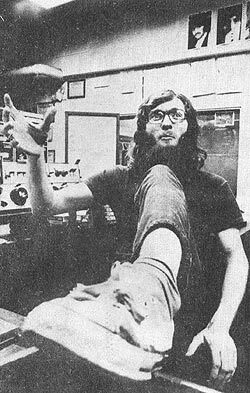 Certainly, I met many people during my career in radio that were unforgettable, and they have been among the greatest gifts of my life.
. . . Go for it, man! . . . Shotgun Johnny Rock 'n' Roll Ringo, shown at WFEC in Harrisburg, about a year before he moved to KAFY in Bakersfield. Wearing large-rimmed glasses, he was over 6 feet tall, lean, with long red hair and a thick red beard. Shotgun Johnny Rock 'n' Roll Ringo (aka: Robert Ditto) loved to play Top 40 records in the nighttime. His on-air performance was not only loud, but wildly animated, punctuated by his long arms and big hands flying around his head as he screamed into the microphone. On this evening of May, 1977, Shotgun expects (and gets) a winner in KAFY's big contest for the Spring book - The Win Ten Bin. The promotion had been suggested by our consultant, John Rook, and even though the grand prize was impressive (worth over $15,000), it cost the station next to nothing, since all the prizes were provided in exchange for advertising. Contestants had to spend long hours listening for clues to the "exact description" of each prize, and then get lucky enough to get on-the-air. Of course, as each prize was correctly described, more listeners believed they had a chance to win. Best of all, we could control how long the contest would last by making the clues easier or more difficult over the weeks it ran. It's only through REELRADIO that I know Johnny Ringo worked in Norfolk, VA in 1984, and that he was alive and well as recently as 2003. He left a kind message in our "Reel Time Spent Listening" comments. Hey dude, we were young, and we had fun. Thanks for being there.